To be the first outside of the winemakers to try an experimental wine made by a well known Bordelais vigneron (with said winemaker standing right next to me) can be a bit nerve wracking. What if I hate it? What if it’s rubbish? What if I’m wrong and everyone else loves it? Well, none of those things happened when I found myself tasting the very first bottle of savagnin, fresh from the barrel. Savagnin is not a grape that I’m familiar with even if it does feature in the vin jaune wines of the Jura region. 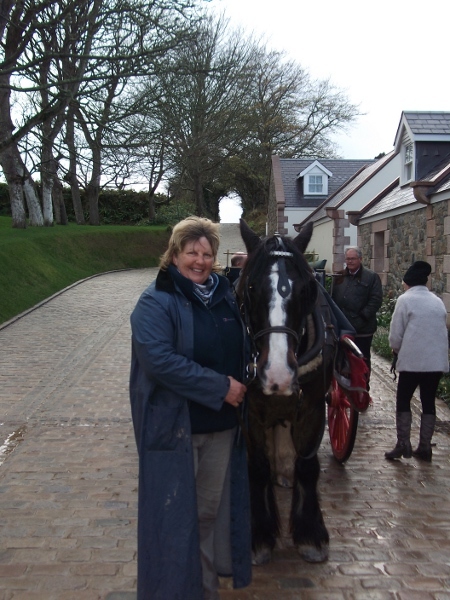 So, I was delighted and surprised to discover it was the first ever vintage of Sark wine. 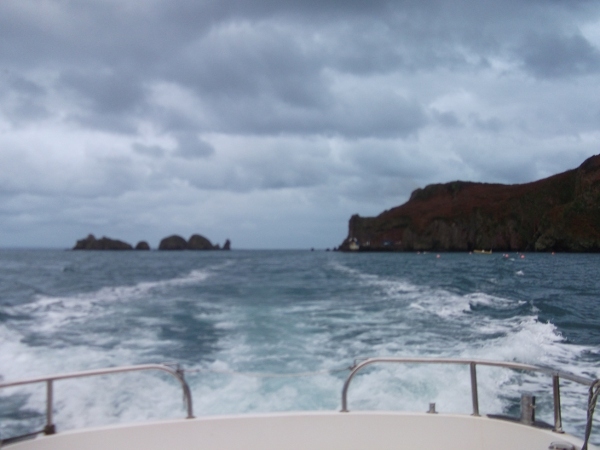 Yes, Sark as in the “Isle of,” one of the Channel Islands, closer the France then England but British nonetheless. 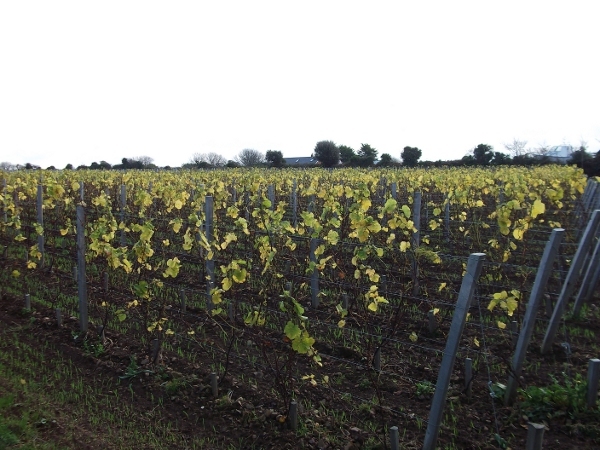 The Sark savagnin was an experimental wine and in reality would only be used in small quantities for the final sparkling wine blend but it was intriguing to try the results of the first harvest of Sark. I was tasting with the Bordelais flying winemaker and consultant, Alain Reynaud, who has been with the project from the very beginning. The vines were planted barely 18 months ago but a lot of care and planning went into the project before one vine was planted. Alain and soil consultant, David Pernet made many trips to the island to assess the terroir and find the best possible spots. The very first thing Alain did when he visited was to start digging through the first plot of land he was shown with his bare hands to see if the soil was suitable. They spent 6 months analyzing the soil before finally picking what they believe to be the best locations. 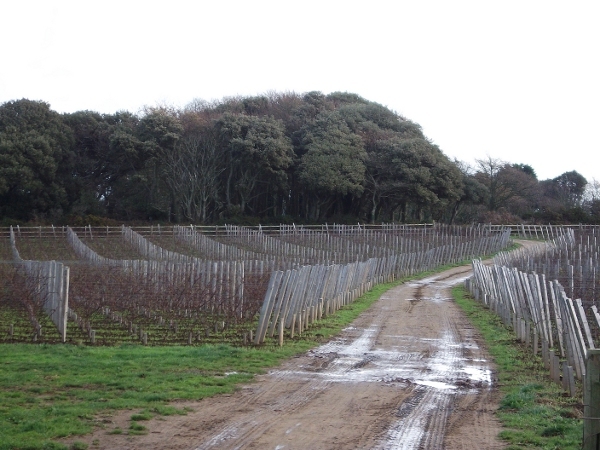 Luckily, the island is primarily made up of granite and schist with a thin layer of topsoil – perfect to make those vines work hard. 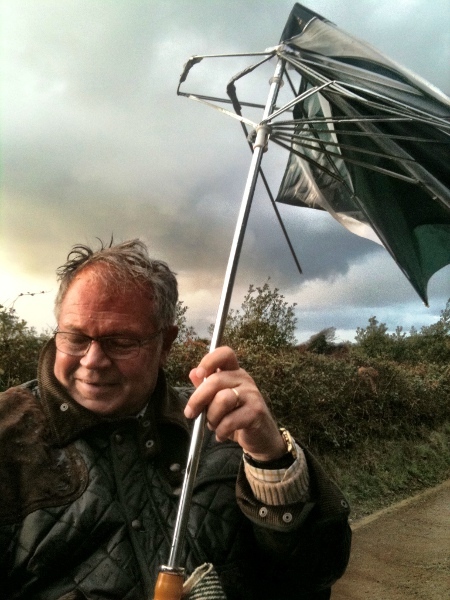 I don’t know what time of year Alain visited but I was there a few weeks ago (early Dec) and it was wet and windy. 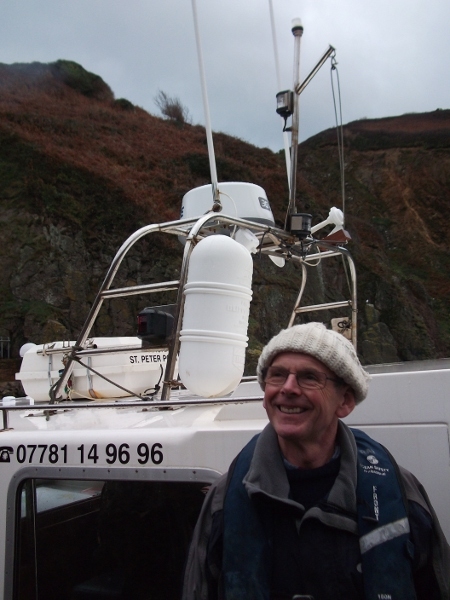 I asked him if there was any problem with humidity being in the middle of the sea but lost his answer amongst the gusts of wind that were buffeted us up in the vineyard. I think the answer was no. Although, he did mention that they have had to spray once or twice for oidium. I asked Alain about the wine tasting “salty” but he assured me that the vineyards are on such a high plateau that they are not affected much by the sea air. 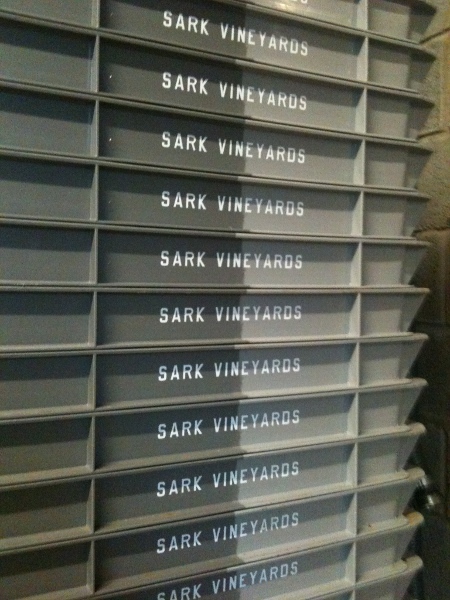 The goal of Sark Vineyards is to make the best wine possible, not just the best wine from the Isle of Sark. Perfection is key to the project, according to Alain. 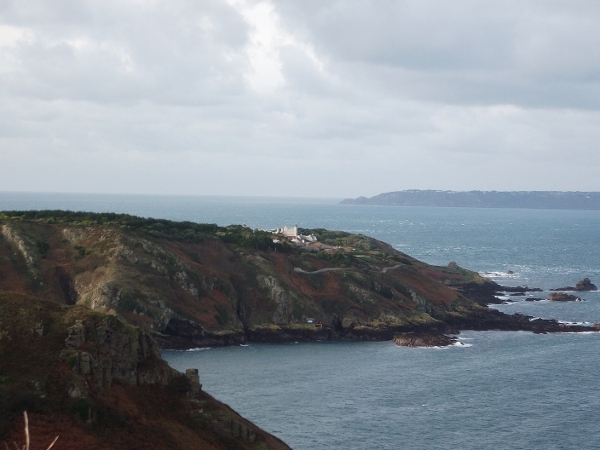 The Barclay brothers do own a sizeable chunk of the island and are backing the project (so far spending £1 million pounds on the venture) but they seem to have given Alain free rein. Their objective is to create a small luxury vineyard, using the best people, choosing the best land and using the most suitable varieties available. So far, they have planted 100,000 vines and plan to plant another 100,000. The majority of the vines are chardonnay, but they have also planted the aforementioned savagnin, pinot gris, albarino, muller thurgau and for the reds, pinot noir and gamay. 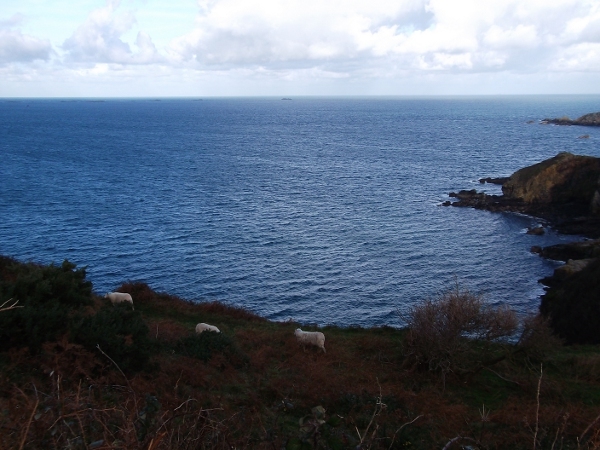 They currently have 11 ha planted which comprises 2% of the island but hope to up that about 3-4% island coverage in total. 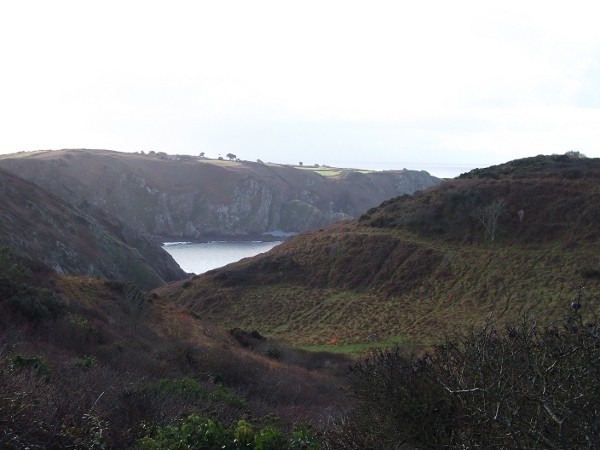 Plans are also afoot to build a sustainable winery into one of the hillsides, the aim being for it to blend into the landscape as much as possible. I even heard Alain joke about how the local sheep will be able to graze on the grass covered roof! 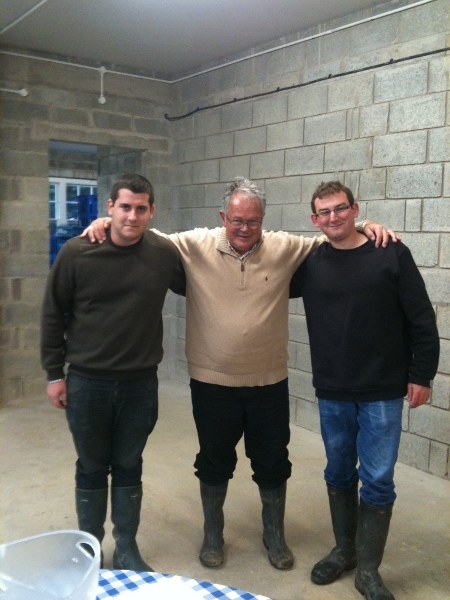 It was an informal tasting in the shell of what will hopefully be a visitor’s tasting room by the Spring. So how did this experimental wine taste? It was unfiltered so pretty much in it’s natural state, re: cloudy, but it was fresh from the barrel. 96% savignin, with the rest comprising pinot gris and chardonnay, it was an appealing aromatic wine, pear and green apple aromas followed by a wisp of white flower and mineral notes . On the palate it had great acidity and was not flabby at all, something I was a bit concerned about as I find English wine can sometimes have a curiously flat note to them. Elderflower and ripe apple on the palate, even though it was experimental, I thought this wine was good enough already and would make a great summertime wine – fresh, floral and vibrant. 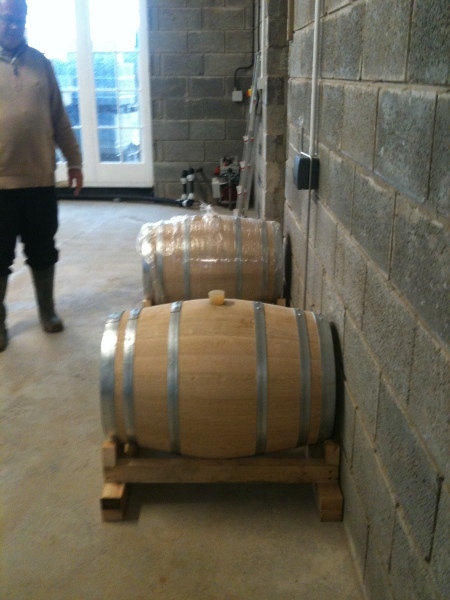 Alain told me they are hoping to the aromatic qualities of the wine the calling card of Sark wine. Based on this first wine, I think that the wines of Sark have a very good future ahead of them. I will be waiting with anticipation to see how the first vintage comes out. 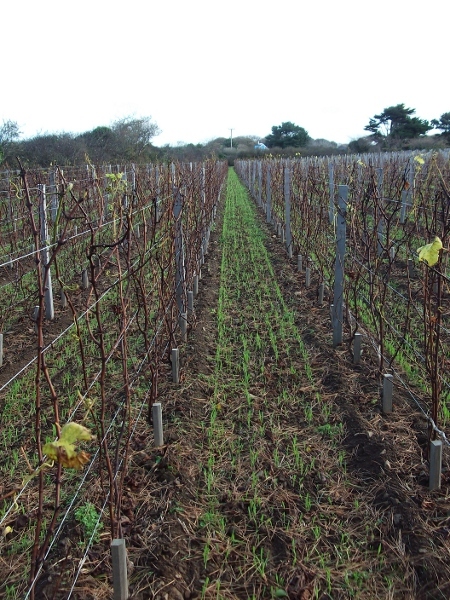 Unfortunately, it will be a few years more before we’ll be tasting Sark English sparkling wine but I think it will be worth the wait. What other up and coming wine regions are out there? Tell me in the comments section, I want to know! Yes – but why? Note that the neighbouring areas of Normandy and Brittany don’t produce any wine, and I suspect that there is a long-standing reason for this. Note also that Western Europe can’t sell all of the wine that it already produces, much of it being of very good quality. French consumption is declining and British consumers prefer American and Antipodean wines to French or Spanish anyway. This looks to me like a vanity project, or maybe there’s some other agenda that we don’t know about. Great stuff I will look forward to this hitting the shelves soon then – Excellent post! Thanks! Although it will be a few more years before it becomes commercially available. Hi, picked this up from your twitter note, its looks like you had a good time at the wineyard, Look forward to trying the wines. 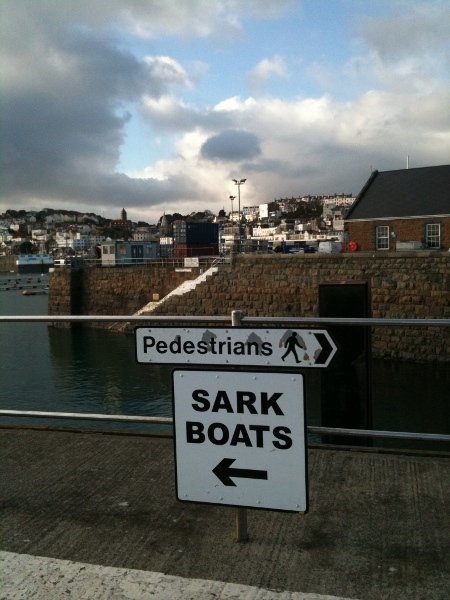 Good job you did not go this week, crossing would have been interesting!!. . We are do alot of wine tasting at http://www.winegifts4u.co.uk so so if you come across any thing please lets us know.